Explore recent scientific discoveries and news as well as CLBB events, commentary, and press. Rapid advances in the brain sciences offer both promise and peril for the law. 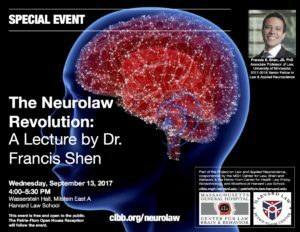 In light of these developments, Dr. Francis Shen explored how neuroscientific analysis of law may revolutionize legal doctrine and practice. Dr. Shen is the third Senior Fellow in Law and Neuroscience in the Project on Law and Applied Neuroscience, a collaboration between the Center for Law, Brain & Behavior at Massachusetts General Hospital and the Petrie-Flom Center. 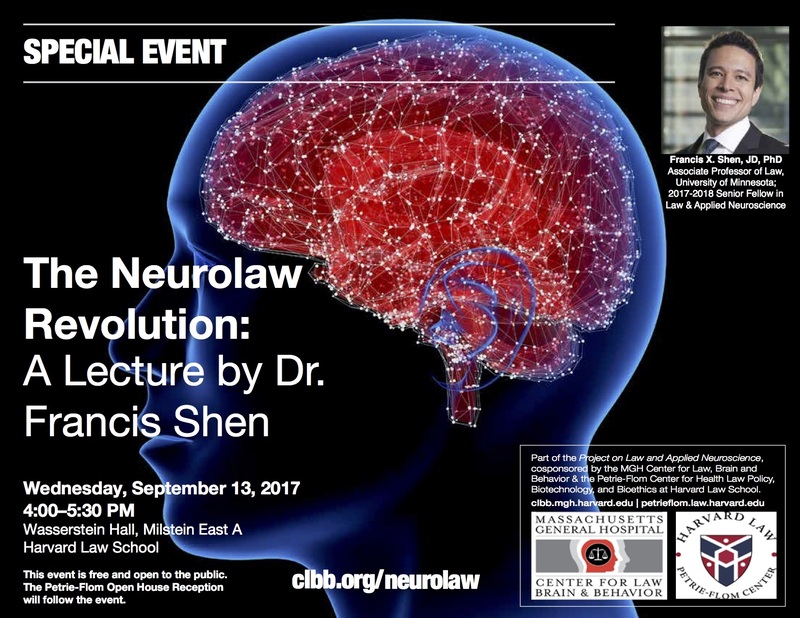 Dr. Shen directs the Shen Neurolaw Lab at the University of Minnesota, is co-author of the first Law and Neuroscience casebook, and serves as Executive Director of Education and Outreach for the MacArthur Foundation Research Network on Law and Neuroscience. This event was held from 4:00-5:30 pm on Wednesday, September 13, at Wasserstein Hall, Milstein East A, Harvard Law School (1585 Massachusetts Ave, 02138). It was free and open to the public. This lecture was followed at 5:30 pm by the Petrie-Flom Center’s 2017 Open House reception.